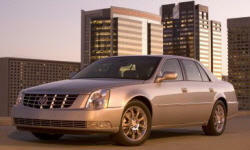 Cadillac DTS Dealer Practices Pros and Cons | Page 1 of 1 | Why Not This Car? Don't ever get a car repaired at Potamkin Cadillac in Manhattan, NY. I'd rather have an infant give it a go. High pressure sales. The introduction of a middleman--the sales manager who destroyed my trust in the dealership.